a. With bus I supplying power, variable speed drive drives 1# pump, consisting of QS1, QF1, QS3, QS7. b. With bus I supplying power, variable speed drive drives 2# pump, consisting of QS1, QF1, QS3, QS8. c. With bus II supplying power, variable speed drive drives 2# pump, consisting of QS2, QF2, QS4, QS8. d. With bus II supplying power, variable speed drive drives 1# pump, consisting of QS2, QF2, QS4, QS7. e. With bus I supplying power, 1# pump runs in direct on line, consisting of QS1, QF1, QF5. 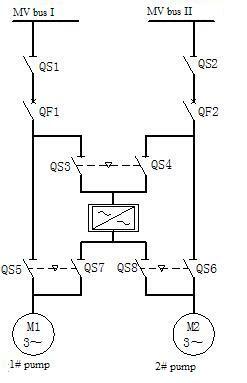 f. With bus II supplying power, 2# pump runs in direct on line, consisting of QS2, QF2, QS6. a. Draining gas of pump room is inflammable and explosive gas. All equipments in pump room are explosion proof. But variable speed drive is non-explosion proof device, it should be installed in an isolated room. Goaf draining system is used to control gas amount not beyond safety regulation, thereby ensuring safe production of mine. In the light of survey, pump usually runs in 35~45Hz. Operation frequency is determined by distance of coal face and drain tail hole. When coal face is close to drain tail hole, frequency is low. Otherwise, frequency is high. Measure gas parameters periodically, analyze and determine operating frequency of pump. In this way, system can ensure gas amount not beyond safety regulation, and ensure fresh air not to enter goaf, avoiding natural fire accident. So raw coal production is enhanced a lot. Impact on motor and other equipments during start and stop is eliminated. Lifetime of pump and motor is extended. variable speed drive control limits impact on power grid during start, reduces peak start power loss. With speed down, lubrication condition of equipments is improved and driving mechanism failure is reduced. Power price: 0.5yuan/kWh, so 707000yuan (USD103970)is saved. Rated power factor of motor is 0.87. Variable speed drive can raise it up to 0.95. So power quality is heightened and power cost declines. In the mining gas draining system, medium voltage variable speed drive controls gas amount of coal face and air return system effectively. It ensures safe production and saves considerable energy.